It’s been a while, but we’re back with an update on the 2017 Year of Kindness (17YOK) in Juneau, Alaska. 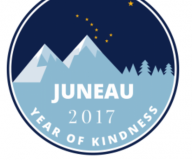 The Juneau Police Department and local residents have been carrying out exciting projects throughout 2017, and recently pledged to commit to kindness even after the year is over. “Cocoa and Kindness were celebrated on November 12 in Juneau! We had approximately 160 people come to the field house to have some warm cocoa or cider, eat some cookies, and chat about kindness. Many people “walked a mile for kindness” on the track, and many traded painted stones for the “Juneau Rocks” kindness campaign. An exciting new addition to the festivities were the Kindness Banners! These banners will be signed by everyone in Juneau, and hung for New Year’s Eve festivities. They are a pledge for everyone to continue their focus on kindness through 2018 and beyond! During the closing ceremonies on December 31, people will be invited to walk through these banners, symbolizing stepping into a new year with a renewed commitment to kindness.